London, Bloomsbury Academic, 2013, 219 p.
For the past century Britain and France have remained uneasy neighbours, despite their common membership in NATO and the European Union, and despite their struggle for survival against a common enemy in two world wars. This is usually explained by reference to their long history of mutual antagonism in earlier times and their imperial rivalry which endured into the twentieth century. However, the contributors to this important collection of essays argue that it is also bound up with their different experience in the two world wars and the different ways in which the wars were perceived and remembered. For France, the First World War was a straight forward affair provoked by German invasion, whereas for Britain the reason for entering the war was never so obvious and as the casualties mounted it seemed increasingly grotesque and absurd. The Second World War was experienced in almost opposite ways. On this occasion, Britain perceived it as a straight forward struggle against Nazi (and eventually Italian fascist and Japanese imperialist) aggression and a test of British character which was passed with flying colours; for France the experience was dominated by military defeat and deep internal divisions, creating in Robert Frank’s words a ‘syndrome of 1940’ as deep and enduring as the ‘Vichy syndrome’ (p. 181). Compounding the differences of experience or perception, Britain and France constructed narrowly national narratives of the two world wars which largely ignored the role of the other power and even on occasion made it the scapegoat for their failure. Long after each war they continued to engage in acts of selective remembrance and forgetting which further marginalised the other power’s role. While the process was largely unintentional, the result nevertheless was to prolong their mutual alienation. The section of the volume on the First World War includes essays by William Philpott and Elizabeth Greenhalgh, whose recent books on coalition warfare on the Western Front have signally contributed to our understanding of Franco-British military relations. As they point out in their essays, the two powers were poorly served by their official histories of the war. In Britain, the official history uncritically accepted the one-sided version of events recorded by Field Marshal Douglas Haig, commander-in-chief of the British forces. It made practically no attempt to explain when or how the British and French armies combined their operations. It thus encouraged the impression that Britain fought almost alone for much of the war, including the great battle of the Somme in 1916 which involved the French army as much as the British; and where it mentioned the French army, its setbacks figure more prominently than its victories. This is notably the case with the battles of Verdun and the Chemin des Dames where the official history provided brief accounts of France’s initial setbacks in 1916 and spring 1917, but passed over in silence its successful advances in the second half of 1917. 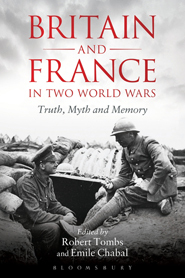 The result, in Philpott’s words, is a ‘meta-narrative of French decline’ (p. 55), which ultimately linked Verdun in 1916 with the Battle of France in 1940. Not only did the official history corroborate Haig’s claim that in the final hundred days of the war the British army almost alone defeated the German forces; it also reinforced the British stereotype of France as ‘a womanly nation, weak, decadent, in decline and a drain on, not a support to, its British ally’ (p. 53). The section of the volume on the Second World War contains acute essays by Martin Alexander on the retreat of British and French forces to Dunkirk in 1940, Sébastien Albertelli on British and Gaullist competition for influence over the French internal Resistance, and Olivier Wieviorka on the military operations that liberated France in 1944, all of which highlight the divergent perspective British and French participants and observers. These are followed by more general essays by Jay Winter, Robert Frank and David Reynolds which ably sum up the impact of the wars upon the collective memory of the two countries. As Frank points out, the British record of the Second World War represented Dunkirk not as a humiliating defeat, but as a heroic escape from the jaws of destruction. Both the British and French record, however, omitted the highly creditable role of the French army in 1940 which made the British retreat from Dunkirk possible. The French record also largely passed over Britain’s important role in the liberation of France. Such was the humiliation of 1940 that France seemed scarcely able to credit Britain’s contributions. Together, the three chapters on the First World War, three on the Second World War, three on remembering and forgetting, and three introductory essays form a coherent and highly readable account of Franco-British relations in the first half of the twentieth century. Inevitably, in a collective volume like this, some repetition occurs. It nonetheless provides a showcase for recent scholarship and in some cases new research. Together, the contributions offer a vivid illustration of how the same event can yield sharply divergent memories in two neighbouring countries. If there is a flaw, it is that the authors repeatedly strain the evidence in their wholly laudable attempts to be even-handed between the British and French historical record. Thus, for instance, the first essay by John Keiger affirms that the crisis of July 1914 exposed profound cultural differences between Britain and France and mutual incomprehension over their obligations to one another. Keiger singles out Paul Cambon, the long-time French ambassador in London for his failure to understand Britain’s unyielding opposition to foreign defence commitments, the absence of commitments in the Entente cordiale of 1904, and even the British system of cabinet government. (The military historian Gary Sheffield, writes of Cambon in his introductory essay: ‘a little knowledge was a dangerous thing.’ (p. 20)) But arguably the crisis in Franco-British relations was mainly due, not to cultural differences or mutual incomprehension and certainly not to Cambon’s inability to understand Britain’s opposition to foreign commitments or its system of government. In fact, as early as 1902 Britain had entered into a formal alliance with Japan and in 1911 had negotiated its renewal. In 1912, Britain also went well beyond the Entente cordiale by entering into naval and military agreements with France. As Keiger twice acknowledges, Winston Churchill, the first lord of the Admiralty, was in no doubt that these agreements placed a moral obligation upon Britain to come to France’s assistance in face of German aggression. The crisis of 1914 was due, not to Britain’s refusal to enter into commitments, formal or otherwise: it arose because Herbert Asquith, the Prime Minister, and Edward Grey, the Foreign Secretary, who had approved the agreements with France, had chosen not to inform their cabinet colleagues because they feared that some were likely to raise objections. Cambon had been encouraged by senior Foreign Office officials to believe that France could count on British support in a crisis. He could scarcely know what had or had not been said in confidence by one British minister to another. Yet Keiger’s essay, while professing to demonstrate mutual incomprehension, dwells almost exclusively upon French shortcomings. It thus replicates the sort of bias that the volume itself is intended to expose. The behaviour of Field Marshal Haig during the First World War illustrates the same point. Throughout the conflict British and French commanders grumbled about the inadequate manpower contributions of the other power. The French, according to Greenhalgh, generally overlooked the vital contribution of Britain’s merchant marine, which kept the Alliance supplied and brought American forces to Europe, and its mining industry, which provided the necessary energy requirements. Philpott, in an effort at even-handedness, equates Haig’s recriminations with those of General Victor Huguet, whose book, L’Intervention militaire britannique en 1914, was published in English under the misleading title, Britain and the War: A French Indictment (1928). Huguet, in fact, was not indicting Britain. Instead, he was merely expressing regret that, since the war’s end British writers seemed to turn their backs on France and to ignore its contribution to the war and the need for continued solidarity. Haig’s complaints were of a different order altogether. As he revealed in his diaries, he regarded the French as a devious people who had exploited Britain’s solidarity during the war to save their own skins, but would not hesitate to stab Britain in the back at the first opportunity. Unlike Huguet, Haig had not welcomed Franco-British solidarity during the war, or regretted its abandonment after the Armistice. The contest between British officials and General de Gaulle for control of the internal French Resistance offers another illustration of asymmetry. As a refugee on British soil, de Gaulle remained in an extremely weak situation until the final stages of the war. His habit of behaving as if he spoke not merely for the Free French but for the French nation itself was therefore almost bound to exasperate his British hosts. As Robert Frank observes, he could behave very churlishly, as after the Yalta conference in January 1945 when he failed to acknowledge Churchill’s success in securing an occupation zone in Germany, a seat for France on the Allied Control Commission and the likelihood of a permanent seat on the UN Security Council. Yet by 1945, as the evidence in Albertelli’s essay indicates, de Gaulle had endured four years of friction with British officials who had shown not merely indifference to the Free French on account of their weakness, but sought actively to constrain their activities. The British had also attempted to work with Vichy until 1941, and subsequently they repeatedly refused de Gaulle the opportunity to participate in the liberation of French territory. Some of this may be put down to simple expediency or American pressure, but an element of the same prejudice displayed by Haig in the previous war also appears to have been present. A final example of the asymmetrical relationship appears in the introductory essay, suggestively entitled ‘Two Great Peoples’, by Robert Tombs who was responsible for the conference at Cambridge University in 2011 from which this book emerged. Tombs, discussing the unceasing difficulties that mark Franco-British relations, cites a poll published in Libération in April 2004, which reported that the words French people most commonly chose to describe the British were ‘isolated’, ‘insular’ and ‘selfish’, while the words British people most commonly chose for the French were ‘untrustworthy’, ‘treacherous’ and (nearly one in three) ‘cowardly’ (p. 2). No doubt the choice of words is partly explained by the timing of the survey, which was taken barely a year after the launch of the second Gulf war. Britain had joined the United States in invading Iraq despite the absence of a second UN resolution authorising the use of force, and the British government had justified its decision to proceed by claiming – wrongly – that President Chirac had expressed his intention to veto any such resolution if it came before the UN Security Council. Tombs, however, regards the words chosen by French and British participants in the poll as equivalent, when surely they are not. The choice of descriptors indicates that the French regretted that their relationship with Britain was not better and that the British were not so aloof. In contrast, the British clearly did not regret their distance from the French. After all, who would aspire to friendship with a people who are untrustworthy, treacherous and cowardly? The contributors to this volume have highlighted several common elements in the construction of one-sided British and French narratives of the two world wars. But the existence of visceral British hostility of France helps explain what the authors present as noteworthy but distinct phenomena. Jay Winter, writing on the First World War, mentions the British view of the war as a pointless tragedy, the British ‘fixation’ on psychiatric illness, known then as ‘shell-shock’ (p. 174), Britain’s often remarkably enigmatic war memorials, and the tendency of the British state to turn its back on veterans and victims of the war. Arguably all of the mare linked to the British belief that they had been drawn into the war by France in its bid to regain Alsace-Lorraine from Germany. Lloyd George, the British Prime Minister, repeated this claim not once but several times at the Paris Peace Conference in 1919, and other members of the British delegation evidently believed it as well. Awareness of this belief makes it easier to appreciate the distinctiveness of British attitudes to the two world wars and to France in particular, and offers a further explanation of why the two powers have remained cool to one another over the last century.